Awww! 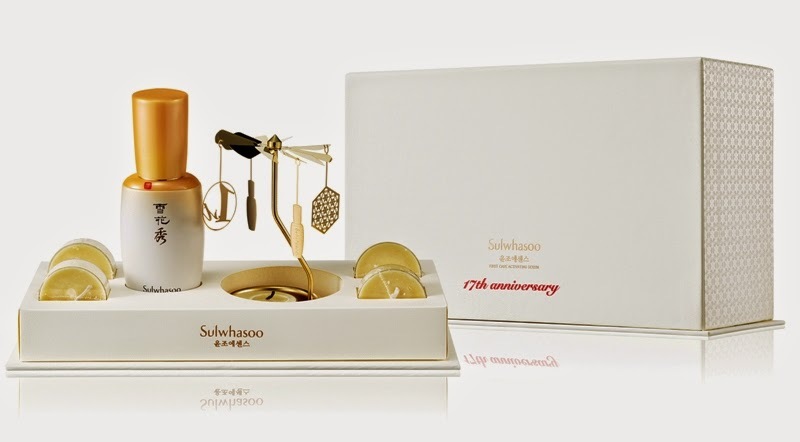 I want this special limited edition Sulwhasoo First Care Activating Serum Rotary Candle Set. It is so pretty, don’t you this so? Well, this year First Care Activating Serum ‘Mother-of-Pearl’ Limited Edition, of its signature First Care Activing Serum; there will be a sized-up bottle of 120ml in a ‘Mother-of-Pearl’ Limited Edition packaging and a special First Care Activating Serum Rotary Candle Set. First Care Activing Serum is the first Korean herbal medicine serum that restores the five components of skin balance - nutrition, resilience, clarity, vitality and regeneration capacity to boost skin hydration and radiance that comes from deep within. First Care Activating Serum Rotary Candle Set promises relaxation and peace of mind. This set is put together to complement the usage of the First Care Activating Serum. The set that comes with one bottle of First Care Activating Serum (60ml), also contains four pieces of Sulwhasoo’s First Peace Candles and a rotary candle stand with rotating icons of Sulwhasoo’s signature products. The First Peace candle is made of 100% natural soy wax and scented with pine, frankincense, patchouli and clove. The scent of pine refreshes and clarifies your mind; the spicy frankincense energizes you; the scent of patchouli comforts you with a deep and warm fragrance while the scent of clove brings your body and mind back to peaceful condition. According to Donguibogam (Treasured Mirror of Eastern Medicine), our skin undergo internal and external changes every seven years and enters the aging process to become dull, dry, and lack of radiance around the age of 35. To resolve the dryness in the skin, it is important to restore the balance of skin. The First Care Activating Serum is made with the original formula of ‘Jaumdan’ to address the main causes of dry skin. After years of clinical study, Sulwhasoo’s Korean herbal medicinal science center carefully selected the five best ingredients for powerful yin enrichment to supplement the yin energy for the balance of skin and for the synergies for Vitality, Nutrition, Clarity, Resilience, and Regeneration. These ingredients are Peony Flower, Mature Lotus Seed, Solomon's Seal, White Lily, and Rehmannia. The First Care Activating Serum ‘Mother-of-pearl’ Limited Edition 120ml and First Care Rotary Candle Set will be available at all Sulwhasoo Counters in Parkson Pavilion KL, Parkson 1 Utama, Parkson KLCC and Parkson Gurney Plaza Penang. Will check this out soon! I prefer korea skincare and Sulwhasoo is one of the best. Nice write up btw!